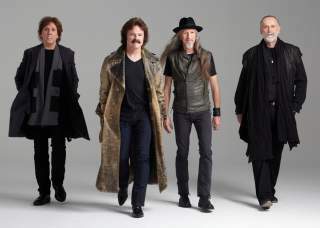 Rock legends The Doobie Brothers released World Gone Crazy today, their first new album in over ten years. Produced by Ted Templeman, their producer throughout the 1970's, the new album combines vintage Doobie Brothers harmonies with the latest recording technology, keeping the sound both classic and fresh. "It's the best thing we've done musically in forever," says founding vocalist Tom Johnston in a recent interview with Billboard. The album features standout tracks like single "Nobody," a remake of a song from their 1971 debut album (watch the video), ballad "Far From Home," "Don't Say Goodbye" with guest vocals from former member Michael McDonald, and "I Know We Won," a duet with legendary musician Willie Nelson. A special deluxe edition of the CD includes a 30 minute, career-retrospective DVD, featuring interviews with the band members and footage from the band's nearly 40 year career. Both editions are available now in stores and online, with a special deluxe bundle that includes a tour t-shirt available at DoobieBros.com. On Mon., Sep. 27 The Doobie Brothers, working with AT&T, Cisco and Marriott, broadcasted the World Gone Crazy album release event utilizing Virtual Meetings by Marriott with AT&T and Cisco TelePresence, the most advanced interactive video conferencing technology available in select Marriott properties worldwide. Over 15,000 people tuned in to watch the event through various sites.